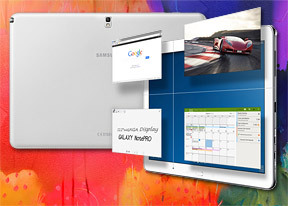 The Samsung Galaxy Note Pro 12.2 features a wide range of proprietary TouchWiz applications. S Note lets you create and customize notebooks. There is a total of 9 preset notebook styles to choose from. After you're done creating a notebook you can go ahead and fill it with notes, drawings (with rich brush options), images, video, voice memos, charts or illustrations, maps, etc. There's yet another note-taking tool called Action Memo. Handwriting recognition kicks in to digitally transform your handwritten notes - for example, scribbling down someone's phone number later lets you tap on the number and save it directly to the phonebook, without having to retype it. This also works for email accounts, street addresses, tasks and general searches. Scrapbook lets you keep any content you browse through on the Note Pro 12.2's screen. You can scrapbook something by circling it with the S Pen with the button pressed. Each item can then be put into a category and filtered by location (i.e. where you were when you added something). Samsung also preloaded the Galaxy Note Pro 12.2 with a video editor to complement the photo editor. You can use the Story album to automatically group photos and videos based on the time and location they were taken. One of the cool apps is Group Play. It shares various multimedia across multiple devices in the same room, but unlike DLNA it's interactive. You can share music (to play through the speakers of all connected devices), images and documents. Multi Vision on the Samsung Galaxy Note Pro 12.2 allows you to stack up several devices and get a bigger resulting screen area for your content. The downside of Group Play is that it's a Samsung-only feature, which limits its applicability. The Android calendar has been replaced with S Planner (as usual). It features six different views: daily, weekly, monthly, yearly, list and tasks. For the month view, events on the selected day are listed in a panel on the right. Adding a new event is quite straightforward and you can also set an alarm to serve as a reminder. Multiple online calendars are supported and they can be color-coded for easier recognition. The calculator app has been redesigned to make better use of the large screen. To the left it features a history of recent calculations and the advanced buttons (e.g. trigonometry) are always visible. The Alarm app is quite advanced too. Each alarm has its own repeat pattern, tone, snooze and repeat settings. It also features Smart alarm (ring quietly, slowly turning the volume up for a more gentle wakeup) and a Location alarm, which only triggers if you're in a predefined location (i.e. disable the get up for work alarm if you wake up somewhere other than home). Both the Wi-Fi only and LTE versions of the Samsung Galaxy Note Pro 12.2 come with a GPS receiver. A-GPS can speed this up quite a bit, but requires Internet access. Cell-ID and Wi-Fi positioning is another quick (but less accurate) option. The Galaxy Note Pro 12.2 comes with Google Maps and Navigation. Voice-guided navigation has become a viable solution already. Not that there are easy ways to make a 12.2" tablet fit your car's interior. It's still great for reviewing routes you can later navigate with your phone. The public transport option can be very useful too. The app also supports the Street View mode, allowing you to see the landmarks you're looking for before you set off. That makes them much easier to find when you arrive. You can also check out comments and ratings, as well as the number of downloads and so on, to help you decide whether the app is worth it. Google has added a small "designed for phones" warning for apps that don't have tablet interfaces. Those can look bad on the large screen, so it's nice to be forewarned. The Google Play Store is full of all sorts of apps. From music / video players, to file managers and various tools, you'll always see something worth trying. The problem is those specifically optimized for tablets are only a fraction of all available apps. Some of the rest scale pretty well to the large screen, but some simply end up pixelated and downright poorly looking. Samsung has naturally made its own Apps store available. It features largely the same type of interface as Google Play, except here you'll find far fewer apps. The good news is Samsung uses this repository to distribute some exclusive titles and some promotional offers, available only to its customers.